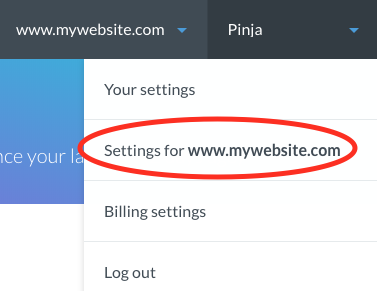 To add a new Google Analytics View to your existing Leadfeeder or replace an existing Google Analytics View with a new one you should head to your Website Settings. STEP 1: Click your name on the right upper corner and selecting Settings for... from the menu. STEP 2: Select the tab Website and Google Analytics views on the left side. Click then Connect another Google Analytics View. From your list, find the GA view you created that filters out page traffic. It will take between 24-48 hours for the new data to reflect in Leadfeeder. NOTE: If you want to remove the old Google Analytics view, click on the red Detach button for the GA view you want to remove. Old lead data that has already been collected in your Leadfeeder will not be removed. The new GA view will only report on new traffic going forward. How can I design a custom feed in Leadfeeder to catch only the most relevant companies?